/ Modified aug 15, 2016 2:45 p.m.
"Paris has the Eiffel Tower, Sydney has the opera house, Pisa has the leaning tower and we have the London Bridge." Lake Havasu City is about a five-hour drive from Tucson: through Phoenix (hopefully traffic is flowing), past the nuclear plant and 339th Avenue. Eventually, Google Maps will instruct you to exit Interstate 10 and head north. The desert is flat and flecked with bushes that look thirsty. Mile after mile, it feels like the surface of the moon. And then, the dirt turns redder, more Mars-like. And finally, those welcomed words: "You have reached your destination." "We call it the 'Home of the London Bridge,'" said Jan Kassies, the city's director of visitor services. Jan has a big job in this tiny town of 50,000 that gets 100,000 visitors each year. Many of them come to check up on the improbable story of this London Bridge. "And then they see we are more than a bridge. The bridge is the first attraction. Then you see we have a wonderful town, wonderful lake." The bridge, the town: Neither would be here if it weren’t for humans with wild and very big ideas. It all started with the lake, though, which used to not be a lake at all and was just part of the Colorado River. The area was for many years home to the Chemehuevi Indians. "And it was kind of sad because they lived on the banks of the river," said Jan. "When the lake came they had to move." The lake came when Parker Dam was completed in 1938. Fast forward to World War II. "A little landing strip was built and pilots would come train here because they had to fight in the Sahara (Desert)," said Jan. Havasu's landscape resembled the extreme conditions of the Sahara. After the war, a few stayed and opened a boat rental company. In the 1950s, a man named Robert McCulloch discovered the area. "Robert McCulloch is the chainsaw guy," said Jan. "If you talk to older Americans, I think every American who had more than one tree had a McCulloch chainsaw." His factory was located near the Los Angeles Airport, and as LAX grew, he was pushed out. "He said, 'I want to go to Havasu.' But there was nothing. He bought land, and he said, 'I’m going to build a town of 70,000 people and move my factory over there.' And that’s what he did," Jan said. First, he needed to attract people to this isolated spot in the middle of the desert. "So McCulloch bought 10 airplanes. He invited people to come, free flight, free stay, free food," said Jan.
McCulloch was a businessman uninterested in giving away free holidays. He thought he could sell land with a sales pitch that involved wining and dining in the desert outpost. LouAnn and Vall Striyle came on one of his trips. It was snowing in Oregon the day they boarded McCulloch’s plane. A few hours later they landed in Havasu. "It was 77 degrees and the sun was shining,” said LouAnn. "My husband said, ‘We’re moving here.'" "I knew immediately I didn’t want to live in that miserable weather anymore," said Vall. They moved in 1969, when the town had a population of 800. "Our family thought we were crazy," said LouAnn. "Well, we were a little bit crazy," said Vall. By the time the Striyles moved to Havasu, McCulloch had already realized that to get enough people there he needed more than just jobs to make it a destination. He needed a landmark. "And then he heard that London Bridge was for sale," said Jan. "And he thought: 'That is my thing. If I buy London Bridge everyone will know about Havasu City.' So he bought the London Bridge and he brought it over. It sounds simple, doesn’t it?" The bridge’s granite pieces were numbered, taken apart, shipped through the Panama Canal to Long Beach and then trucked to Lake Havasu. Vall Striyle was one of the 30 men who worked to reconstruct the bridge. "I think it was the most interesting job I had in my life," said Vall. It was two and a half years of intensive physical work in the grueling heat. LouAnn said the men would start in the early hours of the day and be home by 2 p.m. They finished in 1971, and McCulloch unveiled the bridge with pomp and circumstance fit for a king. "It was a big celebration. Really big," said Vall. "He didn't spare any money." "The bridge was closed off and covered in red carpet," said LouAnn. The over-the-top celebration, the red carpet, the bridge – it was typical of McCulloch. "He always did something out of the ordinary," said Jan. "And a lot of people said, 'My god, how can you do that? Buy a bridge and bring it to the desert where you don't need a bridge?' 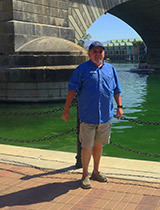 … When the London Bridge came over here, everybody knew about Lake Havasu City." View of the London Bridge from below. Today the bridge is adorned in alternating British and American flags. On the banks of the river underneath its vaulted arches is a burger shop, a shaved ice stand and boat rental companies. Pia Poulsen and her family came from Denmark to see the bridge, one of the stops on their four-week road trip through the US. "It’s nice," she said, looking up at the bridge. "But we’ve been to London, so we can see it is true and that’s what it looks like. It’s not the Tower Bridge, but it is one of the other ones." Rumors suggest McCulloch thought he was buying London’s Tower Bridge, a notion Jan balks at. "No, no, no. I don't want to hear that question," he said of the rumor. "That is made up by the British. I think they were a little ashamed that they sold such a wonderful bridge." 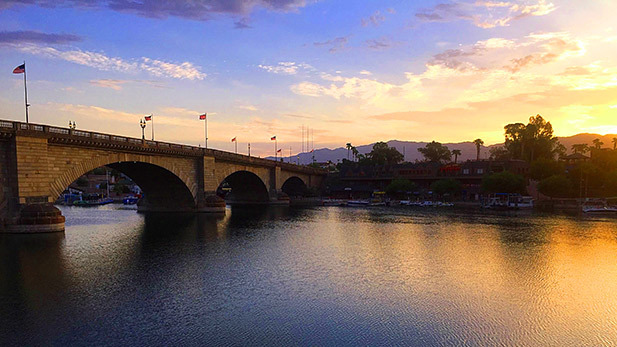 The real origins of that rumor are unknown, but the bridge has had a profound impact on Lake Havasu City. "The bridge actually gives the whole town its identity," said Vall. "Paris has the Eiffel Tower," said Jan, "Sydney has the opera house, Pisa has the leaning tower and we have the London Bridge." Click here for more information about the London Bridge.